NEW YORK (AP) With injuries on both sides, the point guard matchup came down to LeBron James against Spencer Dinwiddie. 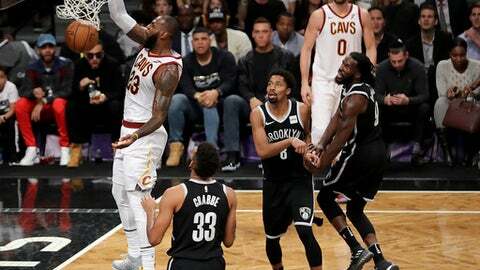 Dinwiddie hit the go-ahead 3-pointer with 43 seconds left, and the Brooklyn Nets overcame James’ first triple-double of the season to beat the Cleveland Cavaliers 112-107 on Wednesday night. A former second-round pick of Detroit starting only because of injuries to Jeremy Lin and D’Angelo Russell, Dinwiddie scored a career-high 22 points as the Nets blew a 14-point lead in the final quarter but recovered to improve to 3-2 – the same record as the defending Eastern Conference champion Cavaliers. James had 29 points, 13 assists and 10 rebounds in his 56th triple-double, but he missed two free throws – the second intentionally – with the Cavaliers trailing by two with 7.6 seconds remaining. DeMarre Carroll then hit a free throw and the Cavs’ long inbounds pass intended for James went out of bounds. Rondae Hollis-Jefferson and Allen Crabbe added 19 points apiece and Carroll scored 18 for the Nets, who bounced back from Tuesday’s loss in Orlando, when Russell sprained his right knee to join Lin on the injured list, and fell just shy of becoming the first NBA team in 32 years to open a season with five straight 115-point games. With Derrick Rose still nursing a sprained left ankle and Dwyane Wade joining him after bruising his left knee in Tuesday’s victory over Chicago, James started at point guard in his 772nd game with the Cavs, passing former teammate Zydrunas Ilgauskas for most in team history. He ran the offense fine but his long-range shooters couldn’t convert enough of his passes. Kevin Love finished 4 for 13 from the floor and J.R. Smith was 1 for 9, missing all five 3-point attempts. The Nets led by 14 when Quincy Acy made a 3-pointer to open the scoring in the fourth, but James led the Cavs on a 13-0 run that gave them a 94-92 lead on Love’s 3-pointer. The teams traded narrow leads from there. Cavaliers: Lue said he hoped Rose could play Saturday at New Orleans. … The Cavs had won the last four meetings. Nets: The Nets are 3-0 at home for the first time since 2002-03, when they started 5-0 back in East Rutherford, New Jersey. … The last team with five straight 115-games to open a season was the 1985-86 Pistons. The Nets came in leading the NBA with 123.5 points per game. The Cavaliers will get the Nets’ first-round pick, which originally was dealt to Boston and then sent to Cleveland in the Kyrie Irving-Isaiah Thomas swap. But Lue said the Cavs aren’t paying attention to how the Nets are doing. ”My main focus is just on our team and try to get us to play the right way,” he said before the game.